What is EasyWP Managed WordPress hosting? 2. You can't use domains registered elsewhere. 2. No CDN (Content Delivery Network), yet. Disclosure: Some of the links below are affiliate links, meaning, at no extra cost to you, I will earn a commission if you click and make a purchase. This review is however based on my own experiences after using this service. If you’re looking for an affordable cheap WordPress hosting, then you should’ve come across Namecheap’s WordPress hosting, EasyWp. 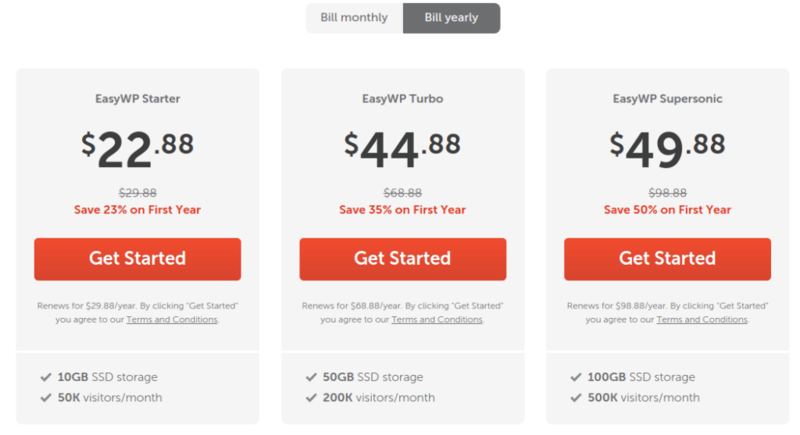 EasyWP Pricing For just $22.88/year, Namecheap gives you a WordPress managed hosting account. However, the question that comes to mind is, is this cheap hosting reliable, is it good enough? In this EasyWP review, I will be unboxing for you what is inside this hosting. Please click the video above to watch a video review where I get to walk you through the dashboard and show you what to expect when you sign up. EasyWP is Namecheap’s hosting platform dedicated to hosting WordPress websites. 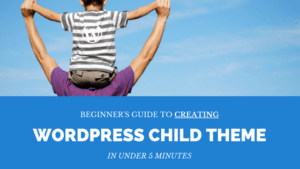 Under this hosting, WordPress is installed and setup for you so you don’t have to install it yourself. Imagine being live in minutes, with everything ready to go. No need to worry about managing your hosting, navigating old panel interfaces or figuring out how to install WordPress. We do it all for you in one click. With our managed WordPress hosting you save time and money. So basically, with EasyWP managed WordPress hosting, just like other WordPress managed hosting (such as WPEngine) installs everything, so you don’t need to worry about the server setup. If you’re wondering what is included in the package, I will break down this for you so you don’t have to guess what you’ll find. As you’d expect with any managed WordPress hosting, you’ll find one WordPress website already installed for you. 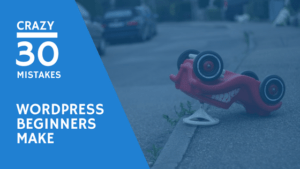 So unlike on a shared hosting, with EasyWP hosting you don’t have to worry about installing and setting up WordPress for yourself, you can start designing and adding content to your website immediately. Noteworthy It's worth noting that whichever plan you choose with EasyWP hosting, you'll only be able to have one website. 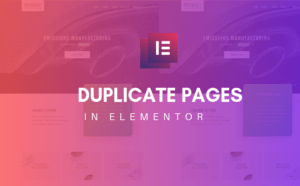 Unlike shared hosting where you can install multiple websites and add multiple domain addons, with EasyWP you’ll only be able to have one website per plan. If you’d like to have a second website, you’ll have to purchase another plan. Before you can link your own custom domain, you’ll receive a free subdomain with which you can access your website. This is a great feature as it allows you to access, develop and share your website immediately without having to wait for those many hours before DNS propagate. Now this one sounds obvious and it’s something you might be already expecting, however it comes with some bit of a twist that I do not like. This means you can’t use your existing Godaddy (or another registrar) domain without having to transfer it to Namecheap. This is something you seriously have to consider before you consider committing to EasyWP hosting services. However, this is something they’re probably considering to resolve in future according to their support. As you can see from above report, one of my websites on EasyWP is actually performing well on speed even before I take extra steps to even make it a lot better. With 3 layers of advanced caching, hosted on Namecheap cloud, you can expect some good speeds even before you apply some performance practices yourself. You actually don’t have to install caching plugins as this has already been taken care of by EasyWP. You may have to improve on image file size among other recommendations. Noteworthy EasyWP doesn't provide CDN (Content Delivery Network) currently. However, according tot their FAQ page, this is in their pipeline and when implemented, this will improve speed and performance even a lot better. Website backups are one of the most important feature and safety net you can rely on when it comes to recovering from a recent silly mistake or malicious hack. 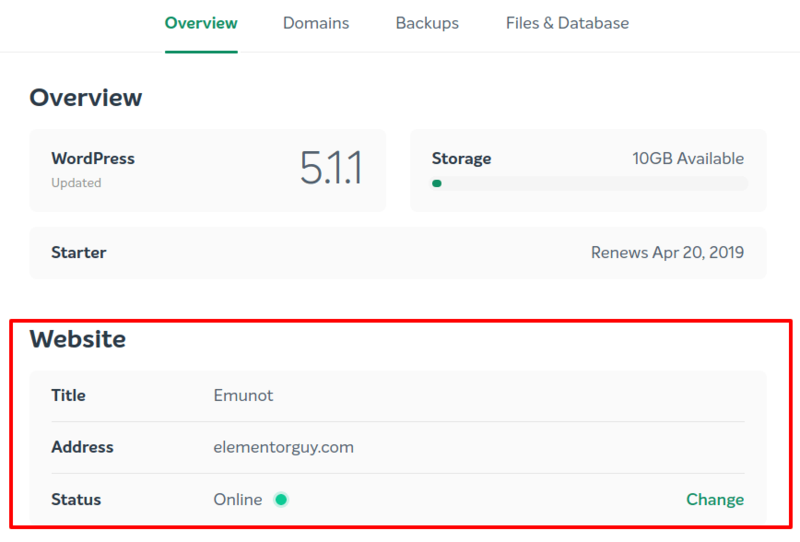 EasyWP provides a one-click backup functionality within their dashboard. With one or two clicks you can backup or restore your website from a previous state. You can also download backed-up files including database files to your computer if you like. This can be great if you’re planing to migrate for instance. Noteworthy Unfortunately, EasyWP currently doesn't provide automatic backups. You therefore can't schedule an automatic backup without having to manually click a button each time you want to back. However, you can install plugins like UpdraftPlus for such. Because you don’t get to have a cPanel with EasyWP, the way to access your files is via Secure File Transfer Protocol. This lets you access and edit your files when when the need to do so arises. 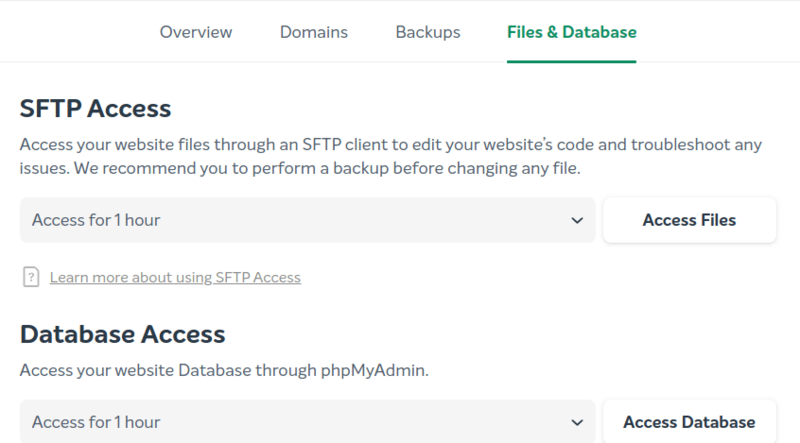 Also, phpMyAdmin for accessing databases isn’t available however, you can access your website database when you need to using the information provided in the dashboard. I find EasyWP dashboard really easy to navigate and straight forward. There’s no destruction so you only focus on useful actions. 1. You can quickly create a new website (by purchasing a new plan) by simply clicking on “New website” button. You don’t have to create a new account to have a second WordPress website. 2. Access your WordPress website dashboard with just a single click. You automatically get logged into your dashboard – easy! 4. Under domains tab, you can setup and connect a domain you’d like your website to use – this takes just a few clicks as long as your website is registered on Namecheap. 5. One-click manual backup is available under Backup tab. You get to quickly create and restore backups as well as downloading backups to your computer. 6. In “Files & Database” tab is where you find SFTP and Database access. With a button you get to access information such as a random username and password you need to access your files or database. There’s no doubt EasyWP is the cheapest, most affordable managed WordPress hosting you can find. Compared to other hosting providers that provide managed WordPress hosting, EasyWP is way cheaper. Because EasyWP is Namecheap’s hosting, I like their customer support and I think they’re great at that. Namecheap give you 30 days to try out and if things don’t work out well you can ask for a refund. Looking at what you get versus what you pay for a managed WordPress hosting. I think EasyWP is well worth the money you spend on it. This doesn’t mean that you should expect crappy services though. So you want to install SSL on your nicely developed website, only to realize the process is not as easy as you thought. I would expect a button to easily push and bang, SSL is setup but that is not the case as you have to go through several steps to setup SSL on your website. It’s almost not possible to install letsencript free SSL. I’m saying almost becuase I personally couldn’t do this but others somehow managed to do it. Namecheap insists you can transfer or redirect your domain from other domain registrar to your temporary subdomain you get. I find this ridiculous because unless if they’re purposely selling this kind of hosting to only Namecheap customers, the ability to add your domain from any registrar would’ve been provided from start. They’re promises though, that this would be implemented in future. EasyWP doesn’t include a CDN yet, however there is a likelihood this will be implemented in the future. This therefore means you might have to rely on third-party services for a content delivery network. I personally think EasyWP is a good managed WordPress hosting service. You certainly get value for money and the product itself is promising and there’s room for improvement. I recommend EasyWP hosting for anyone looking to own an affordable manged WordPress hosting for their website. It’s now your turn to share your thoughts on EasyWP hosting, have you used them and you feel otherwise? Share your thoughts in the comments below.